Bob “Taj” Prator and I braved rainy skies to travel up to the beautiful area of Brevard, NC this past Thursday. I had my doubts. It was pouring as I left my house and I was wondering if the trip would be a wash out. I’m very glad I continued because for the majority of the long weekend, the rain only came at night, and the fishing was unimpeded during the day. In fact, when we arrived at Brevard, the skies were turning blue. Taj and I headed up to the Davidson, close to the hatchery. The fishing was pretty tough, but very interesting. I got 5 or 6 with some on a copperhead softhackle midge dropper and some on an Adams. Nothing big, but interesting, challenging fishing. Taj had the major excitement, with one hitting his dropper and breaking off (I think that was a pretty big one) and a really big boy hitting his Adams and Taj fighting it for a while before it threw the fly. I know that was a big boy (18-20 something or more) because we saw it flash. We ate supper with Tyson “skinny boy” Reed and Rob Kissel. 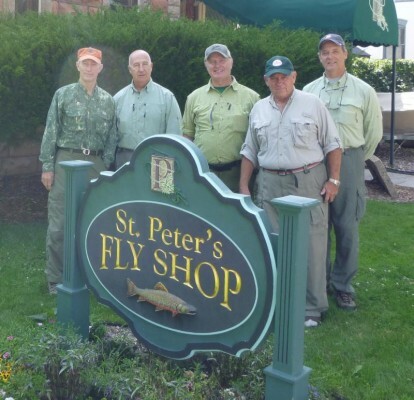 (see their trip report below) They had come up on Wednesday and fished with Alex Bell (the presenter of the NC fly fishing trail at the club meeting). They had nothing but praise for Alex as a guide and a great day on the NC Pigeon, a dh stream. They also fished on Thursday with a guide from Davidson River Outfitters. He had them throwing size 22 and 24 midges with a touch of weight and using pinch on strike indicators. They were successful at this fishing near the hatchery and even saw a 26 inch bruiser. In the afternoon they hit the shop’s private water and pulled in some big boys. It was good to see Jerry Sherman and Mike Behan at the campground. They had a good day on the Davidson. On Friday Taj and I fished really hard, I mean really hard on the Davidson and we might have gotten one strike between us. It was made even worse when Rob Kissel pulled in 6 and had a really big boy on (he estimated 20+) until it threw the fly. Rob had a very good day, especially when the guy at the fly shop said he also had a tough time that day. Sonny Marshal and his friend, Wally, came in the campground that day. It was good to see them. Taj and I were so frustrated that on Saturday we headed to a dh, the East Fork of the French Broad. This small stream is south of Rosman, NC, and is a bit of a strange fish. It is country, but there are several farms and houses around that make you feel you might not be in public water, but it is still a dh and the fish loved the y2k. Between Taj and I we had 30 or 40 fish in a couple of hours fishing. Taj had to leave at noon and I had enough of catching dh fish, so I headed back to the Davidson. I fished 2 hours when I got back to the Davidson without so much as a nibble. I changed flies over and over and never had a hit. My last choice was a desperation choice, the San Juan worm, and it worked to my surprise. I had 8 or 9 fish before it got too dark to fish, including my last and biggest fish of the weekend, an 18-19 inch brown. Sonny was kind enough to invite me over for some of his spaghetti that night and it was really good-I mean REALLY Good! Thanks Sonny. Wally and Sonny went the fly fishing show in Asheville that afternoon (it turned out the show was only 17 miles from the campground) and they had great time at the show. Thanks to Jerry and Mike for having me over-I sure enjoyed the fire. Sunday I awoke to 38 degrees and rain and the rain didn’t seem to be stopping and that was confirmed by weather radar so I broke camp and came home. All in all it was a great trip and I think everybody who went on it had a good time. If you really want to get to know people in the AFFC and make fishing buddies, I encourage you to make it to one of these trips. The next one is tentative for the 2nd weekend of February on the Nantahala, details later. The brookie, fly photo, and Kissel with the guide from Davidson River Outfitters were from the Davidson River. 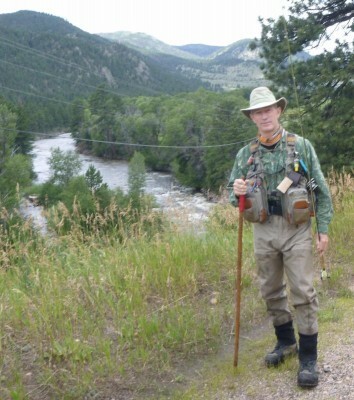 The others were from W Fork of the Pigeon River where we fished with Alex Bell that spoke at November’s meeting. Nice December day on the Davidson. Kissel and I fished Wednesday afternoon with Alex Bell of AB’s Fishing. The generation on the Tuck didn’t cooperate, so we fished the DH of the West Fork of the Pigeon River near Waynesville, NC. Great afternoon. We caught lots of decent fish and several large fish despite fishing behind the morning fishers. 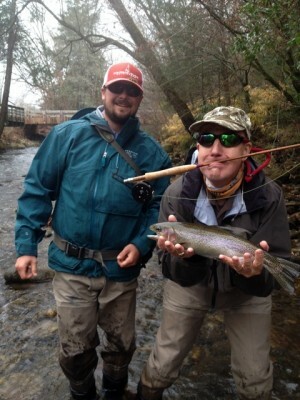 Thursday we fished with Ken Hardwick of Davidson River Outfitters on the Davidson River. Thursday morning we fished near the fish hatchery. What a learning experience. The lightest sets you’ll ever imagine needed. We both probably broke off six or eight fish before kind of getting the hang of it. Tiny flies–sizes 20-24. EXCEPT when the hatchery discharges into the river…then it gets nasty. Ken had us switch to pegged beads above a size 10 or 12 bare hook like fishing in Alaska. Crazy…but it worked! Apparently some of the browns were still spawning…or at least the rainbows thought so. That afternoon we fished their private section. While we did some nymphing, we actually got to cast dries instead of that mind-numbing high stick nymphing! We caught several nice fish late in the day there. Friday we caught up with JD and Taj for breakfast then headed back to the river. The weather wasn’t bad, but it wasn’t nearly as pleasant as the first two days or the following day–Saturday. Tough day. I may have stuck one and missed a couple all day. But seeing Kissel miss a GIGANTIC trout was priceless. I turned to look just in time to see the small breaching whale of a trout splashing back into the river then Kissel jumping with frustration and excitement. Of course, he spent a couple of hours again Saturday trying for that same fish! I had never fished the Davidson before and was a bit intimidated by its reputation. But it is easily accessible and a comfortable sized water. While the areas near the hatchery can get crowded, there are plenty of really good stretches all the way down to town.